No one will ever know as much about the Jupiter as Edmund Nankivell, who bought his first in 1967 and has been researching them ever since. 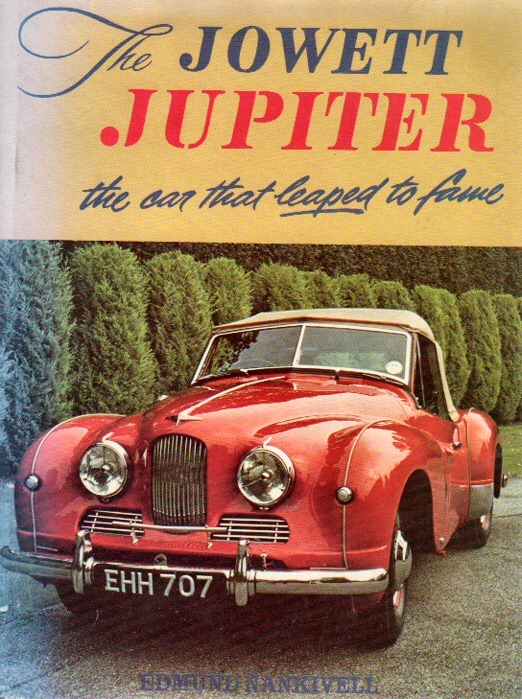 Another book devoted just to the Jowett Jupiter ! Publisher: Penmellyn Publications and still available. Publisher: The Crowood Press in April 2003. Available from all good bookshops. Discounts available. USA readers: The book devotes a full chapter to the Jupiter's USA competition history. February 2005 Road & Track carried a glowing review! They loved it! Australians can visit the Pitstop Bookshop website and enter 'Nankivell' for two books by him. Description: The Jowett Javelin and the sports Jupiter models are the stuff of legend and many stories have been told about them. Some of the stories are even true! This book separates fact from fiction and tells the whole story of the advanced Javelin and Jupiter models, their production and sporting history, special versions and the promising but ultimately still born R4 and CD models that could have saved the company's car manufacturing future. Fans of Jowetts, classic British cars and automotive lost causes will love this beautifully presented book. 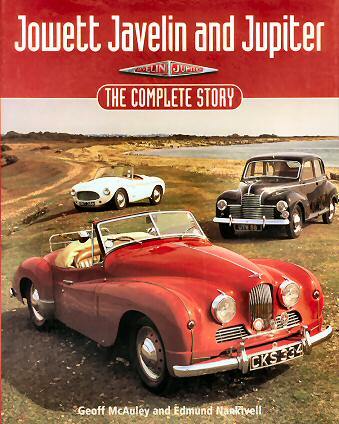 For UK purchasers, the WH Smith online shop lists several book on Jowett cars. Click on this link then type Jowett in the search box. Jowett Javelin and Jupiter - The Complete Story has been reviewed in the UK's Practical Classics magazine June 2003 issue. They liked it a lot! "This is the last word on the great history and tragic demise of one of the most forward-thinking British car manufacturers...makes you realise why so many people have such a great affection for these advanced 'fifties machines". It was Classics magazine Book of the Month for July 2003. 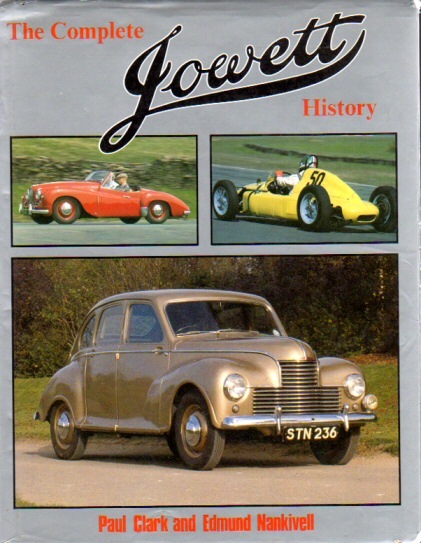 And the 1991 highly regarded hardback book of 224 pages - The Complete Jowett History - published by Haynes has as authors Paul Clark and Edmund Nankivell but in fact Paul only got the deal from Haynes and did absolutely nothing else. Of course, the Jupiter's "Leap to Fame" was its amazing 1950 Class Win at Le Mans when the car was new, only two others existed, and preparation time was short indeed. Noel Stokoe's fourth book is called "Sporting Jowetts". It is published by The History Press priced at £17.99rrp . It is a compilation of reminiscences of people who went sporting in Jowetts. Noel Stokoe's third book is called "Jowett - Advertising the Marque". It is published by Tempus (now the History Press) priced at £12.99rrp (can be purchased from The History Press via their website). For the first time it brings together Jowett's wonderfully colloquial adverts from the 1920s all the way through to the firm's closure in 1954. Noel Stokoe's second book is called "My Car was a Jowett" and is a collection of 110 letters from ex-Jowett owners including Sir Stirling Moss and the explorer John Blashford-Snell. 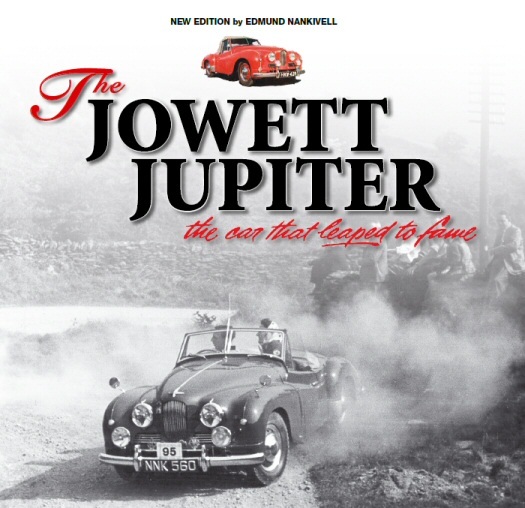 It is a nostalgic and light-hearted look at Jowett ownership from the 1920s onwards. 160 pages, 100 photos. Noel's first book is called "Jowett 1901 - 1954" is published by Tempus (now the History Press) in their Images of Motoring series. The history of the Jowett company is told through over 200 excellent photographs with some text. This book has been reprinted 3 times so far. British Sports Cars in America 1946-1981 (1993) by Jonathan A Stein. Britain's Motor Industry The First Hundred Years (1995) edited by Nick Georgano. Gatso The Never-ending Race (1993) by Michael Allen, Maurice Gatsonides. A major book for Jowett and MG people is entitled Auto-Architect and is subtitled The Autobiography of Gerald Palmer. 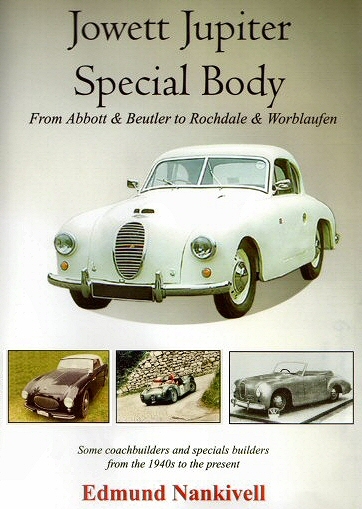 A fascinating and detailed account of the life and designs of the man responsible for the Jowett Javelin, the Wolseley 4/44, MG ZA Magnette, Riley pathfinder, and the Wolseley 6/90. There is much technical detail which does not reduce the book's inherent readability. An example is his discussion on page 51 of why the MG Magnette looks slightly higher at the rear than Gerry had intended. He was the inspiration behind the MGA Twin-cam engine, and played a role in the acquisition by Rover of the 3.5litre V8 engine from Buick. He played no part in the Jupiter project, having left Jowett before it got under way. He had always wanted to design a production sports car but never did, having to content himself with a self-designed special and the restoration of the 1924 Targa Florio Mercedes and a Bugatti. Contact Magna press, Knowle House, Hooke Road, East Horsley, Nr Leatherhead, Surrey KT24 5DY, England. Only 750 copies have been printed in what is described as a Limited Edition. These two books, both very well illustrated and both good in their way and well researched, are disappointing from the Jupiter angle. The A-Z of British Coachbuilders 1919-1960 (Nick Walker - Bay View Books) has interesting things to say about Abbott, Coachcraft, Flewitt, and Harold Radford, four of a much larger number of British coachbuilders to work on Jupiter chassis, but only Radford is mentioned as bodying "at least one Jupiter". The author covers the pre-WWII period with commendable thoroughness, but confines his post-war writings to what he calls the survivors (except for Radford) who stuck to what in his view are "conventional" coachbuilding techniques. He also confines himself to passenger cars, wisely. Briggs Bodies (who built Bradford and Javelin bodies post WWII amongst rather more Fords) are included on the strength of some neat thirties offerings. confusingly uses American terms like 'Sedan' and 'Hood' (for bonnet) but sticks to British English spellings like 'colour'...and I personally find the italicising of every non-English word an irritating archaism in this international age. And that is about it apart from a drawing of Javelin! The elegant Jupiter, whose chassis was designed by Eberan-Eberhorst of Auto Union fame, which won its class three times in a row at Le Mans and class-won the Monte and outright-won the Lisbon international rallies (amongst other victories including Watkins Glen) qualifies only for the briefest of mentions in Mike "The Mouth" Sedgewick's quirky view. Don't let me put you off, though. Get them from your local library. 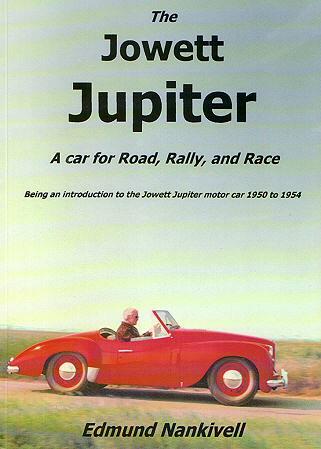 Two Jupiter-relevant books available through conventional car book shops (or Mill House Books, The Mill House, Eastville, Boston, Lincs PE22 8LS, UK - E-mail [email protected]) are JOWETT ALL-TIME GREATS, and POST-WAR JOWETT. Both these books are actually reprints of magazine articles (period and beyond) and period road tests, and there may be some overlap between the two publications. The standard of reprinting is not as high as one would wish, but at least they are available. NB Mill House Books also do PRE-WAR JOWETT and JOWETTS OF THE THIRTIES. Edmund Nankivell (10 December 2016). This book on the Morgan 4-wheeler: Morgan Sports Cars, the Early Years (by two life-long Morgan owner/enthusiasts Alderson and Chapman) has all the flavour of the times when the Jupiter was "in-era". It will be of interest to all who want to know more about amateur motor sport from the thirties up to 1953. Hey, man, what beer are you drinking there ? Scientists have discovered that beer includes replicas of female hormones. So, drinking too much beer could make men into women, hence brewers' droop! To test the findings, tests carried out jointly by MIT, Cambridge University, Manchester College of Science and Technology, and the Guy Lombardo institute of pure science, 100,000 men were forced to drink 14 pints of real ale each day for seven days. Congratulations for persisting this far! Californians can find a genuine Jupiter beer here!